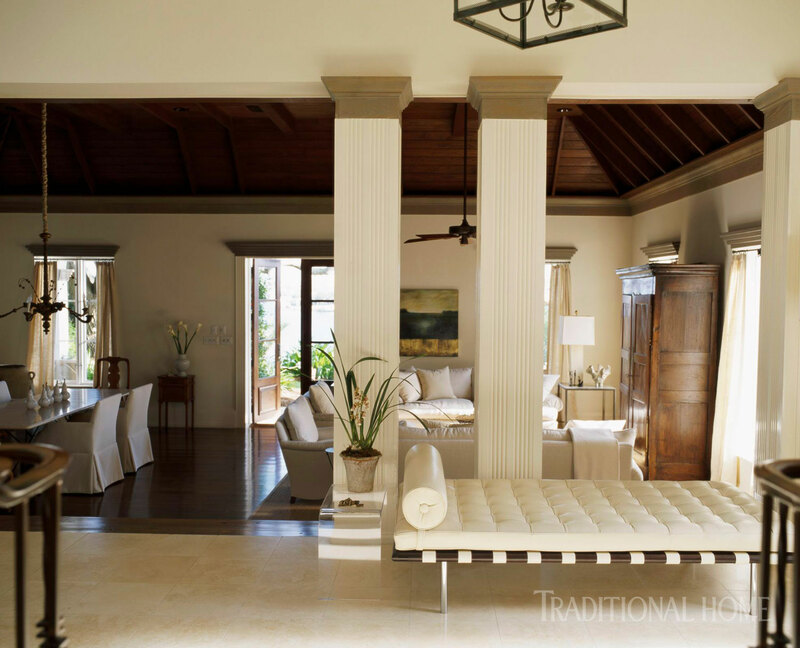 When there's an ocean outside your windows, it's easy to succumb to seaside decorating clichés-plantation shutters, a trophy marlin over the fireplace, bowls of seashells by the bedside, books about Caribbean villas on the cocktail table. 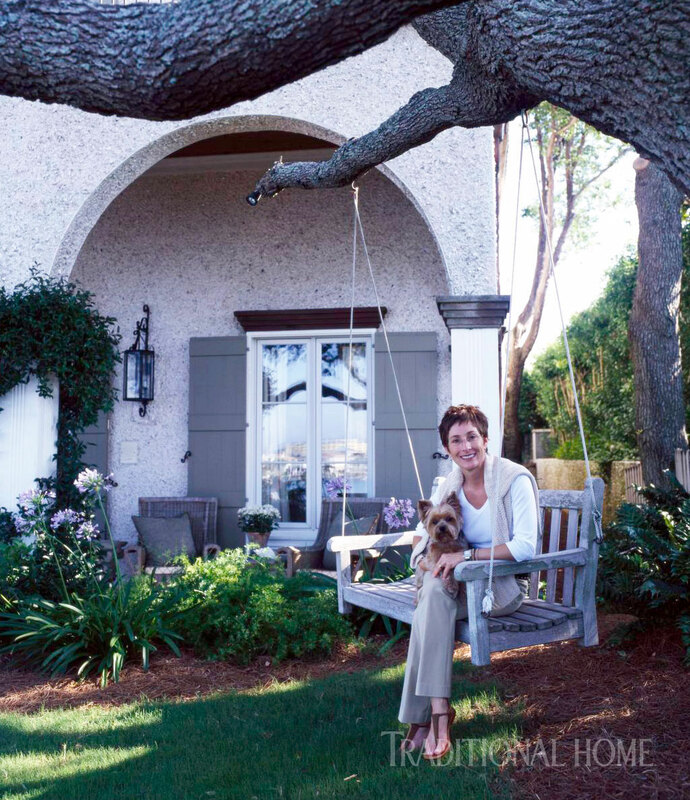 When interior decorator Leah Richardson moved from Atlanta to the Florida resort city of Destin a dozen years ago, however, she was determined to avoid all that maritime mania as she designed, built, and decorated the house she shares with her husband, Jim, an entrepreneur, and their daughter, Lauren, a college student. Though the interiors are as white and pure as a conch bleached by salt and sun, the only shells at the Richardson house are on the outside of the building. Literally. "My grandparents had a house on Jekyll Island, so I was very familiar with tabby," says Leah, referring to an old fashioned type of concrete made of oyster shells, lime, and sand that is a centuries-old construction material in coastal South Carolina and Georgia, where she grew up. " Florida has coquina"—a natural limestone speckled with small shell fragments—"but I wanted a house with large oyster shells," she adds. "The workmen weren't pleased with me at all, because the tabby work took three to four weeks, and each shell has to be hand-thrown on the walls." Leah terraced the steep, narrow lot to allow maximum use of the landscape; at the water's edge is a tabby-clad guest cottage with a roof terrace. That's not the only out-of-the-ordinary gesture in Leah's aesthetic arsenal. 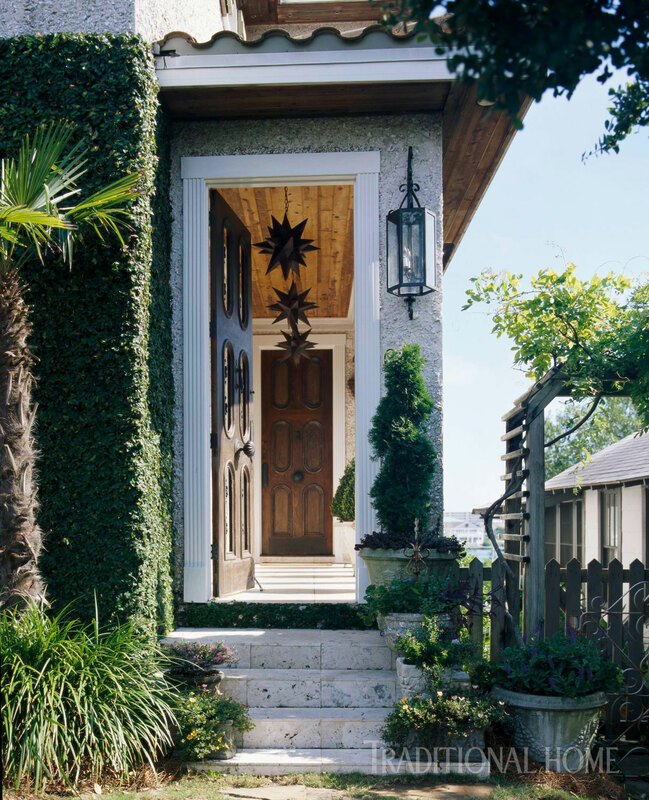 When she and her family moved to Destin, they chose to build on a hillside overlooking the city's bustling harbor rather than gravitate to a location on the more popular flanks of the Gulf of Mexico. "We looked at the beach, the bay, and the harbor, but there's just something about being downtown and having a bit of urban excitement," explains Leah. At the end of the day, for instance, she and Jim often head down the hill to their waterside terrace-glasses of wine in hand and their Yorkshire terrier, Rudy, scampering along beside them. There they can watch the fishing boats come in from a long day, loaded with pompano and tuna, and relax as the city's lights begin to sparkle against the wide and darkening sky. Creeping fig clings to the home's tabby-clad walls. The front door is an Italianate antique. 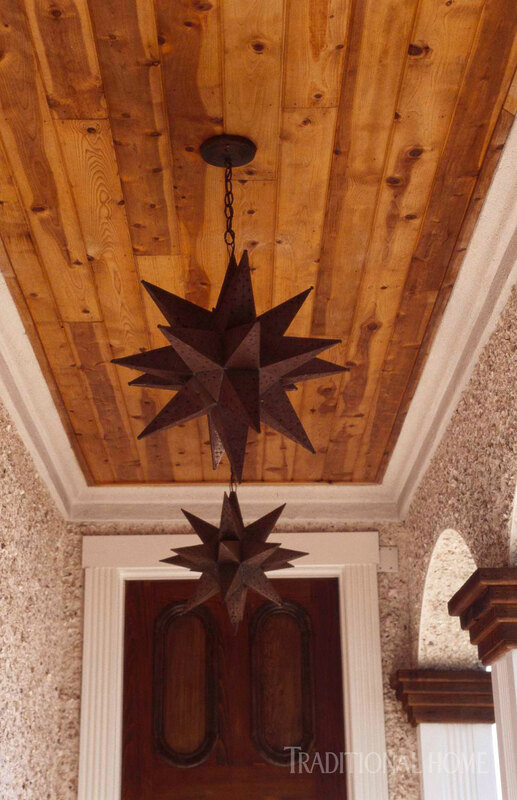 Star fixtures hang from the entry's cedar-plank ceiling. Life at the Richardsons' has an open-arms generosity to it, so the loft-like main floor, with its broad windows and covered flagstone terrace, is "just one big welcoming room," Leah says. "I've always liked large rooms, and it's easy to develop smaller, intimate spaces within that larger space." 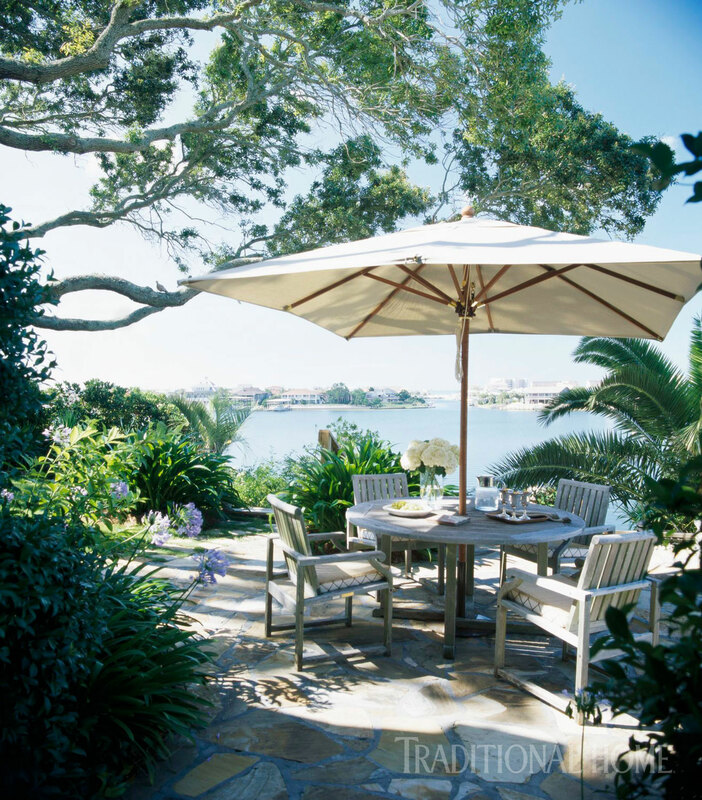 Close to the main house, which is located at the top of the hill, is one of several entertaining areas, a flagstone-covered terrace with a view of Destin harbor and the Gulf of Mexico beyond. The only door in the open plan main living area is to a powder room. Leah designed the iron staircase that leads to the second-floor bedrooms. 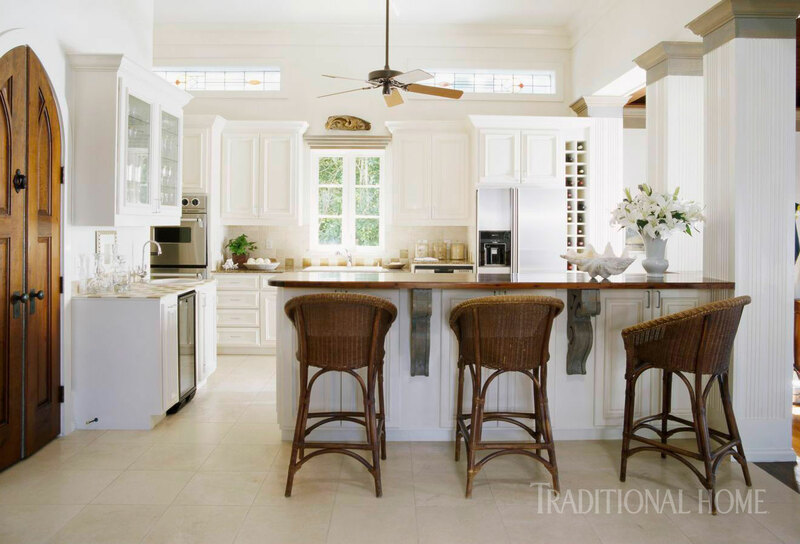 The kitchen and areas for living and dining are gathered beneath a vaulted wood ceiling with exposed beams, and sturdy fluted columns inspired by traditional Mediterranean architecture help define the multipurpose space. So does the single long step that separates the travertine-paved entrance area from the burnished wood floor of the main room; the walnut-stained heart pine planks were milled from the beams of an old Tennessee barn. Additional salvaged bits have been incorporated into the structure. The Italianate front door came from a historic mansion in Pensacola, for instance, and the louvered wall in the study is made of exterior shutters from her father and grandfather's law office. The delicately leaded windows set above the kitchen cabinets once graced a 19th-century Alabama church. "My mother thought I needed to make the kitchen more personal, and since I liked the idea of letting in some light up high on the wall, I took her suggestion." The ground floor of Leah and Jim Richardson's house is a loft-like multipurpose space for cooking, living, and dining. 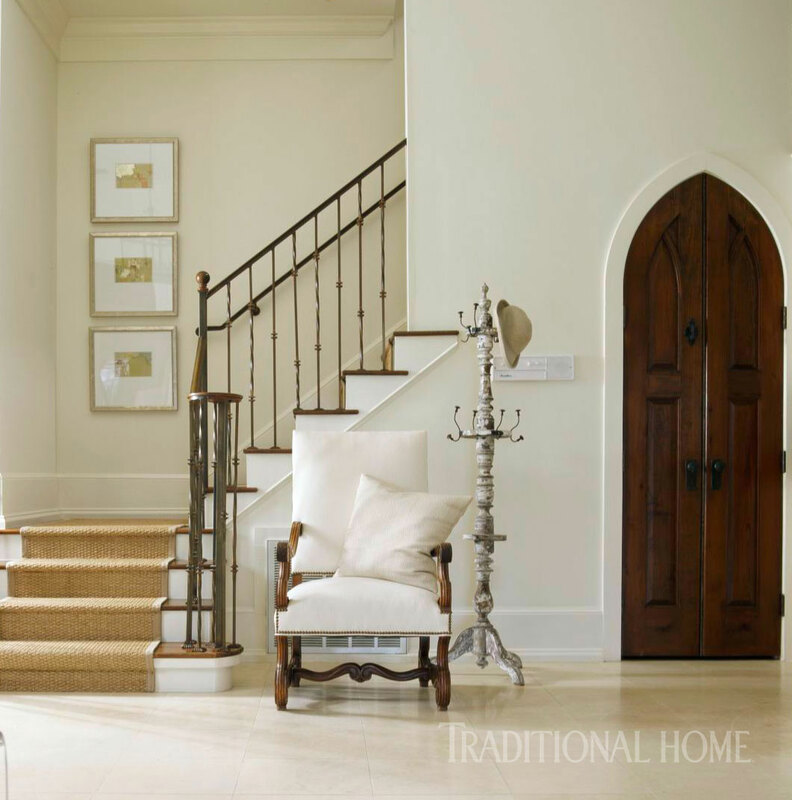 The entrance area is paved with nougat-pale travertine slabs; the wood floor a step below was milled from heart-pine beams salvaged from a Tennessee barn. Separated from the living and dining areas by large columns, the sunny kitchen has clerestory windows from an Alabama church. The travertine marble of the entry continues on the kitchen floor. 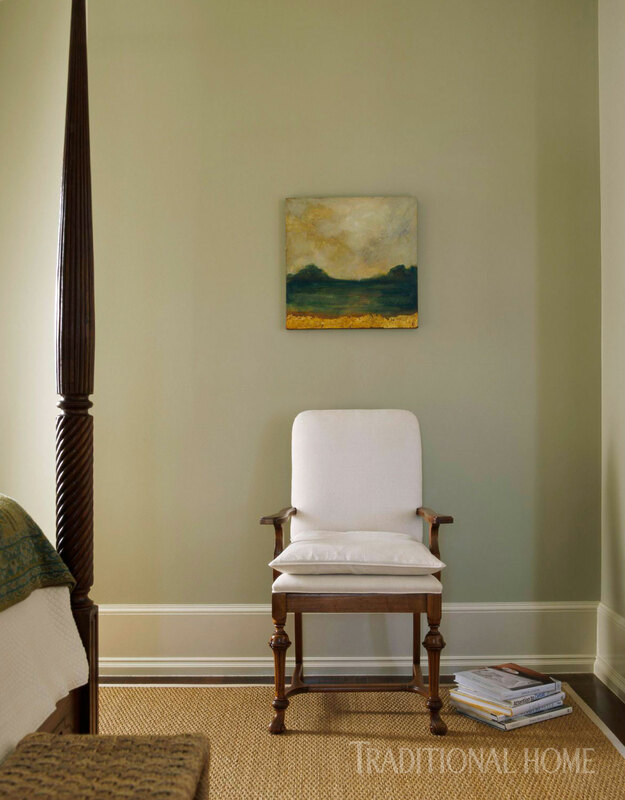 In fact, except for some brilliantly flowered cushions in her daughter's bedroom, the only color in the house that isn't white, the browns of natural wood and rattan, or the sandy beige of woven sisal is a shade of sage green so pale and elusive that it barely registers to the unsuspecting eye. Lit by a chandelier found at a flea market in Paris, the dining area is furnished with a limestone-topped table and a casually elegant mixture of contemporary chairs slipcovered in white linen and antique Italian pearwood armchairs from a plantation estate sale. Neutrals don't mean better-safe-than-sorry decorating. "I love the mix of heavy-weave linen with tighter-weave linen, the quilting of matelassé, the nubbiness of cotton." And Leah's roving eye has led her to accumulate a carefully edited collection of objects whose power is in their scale and silhouette. 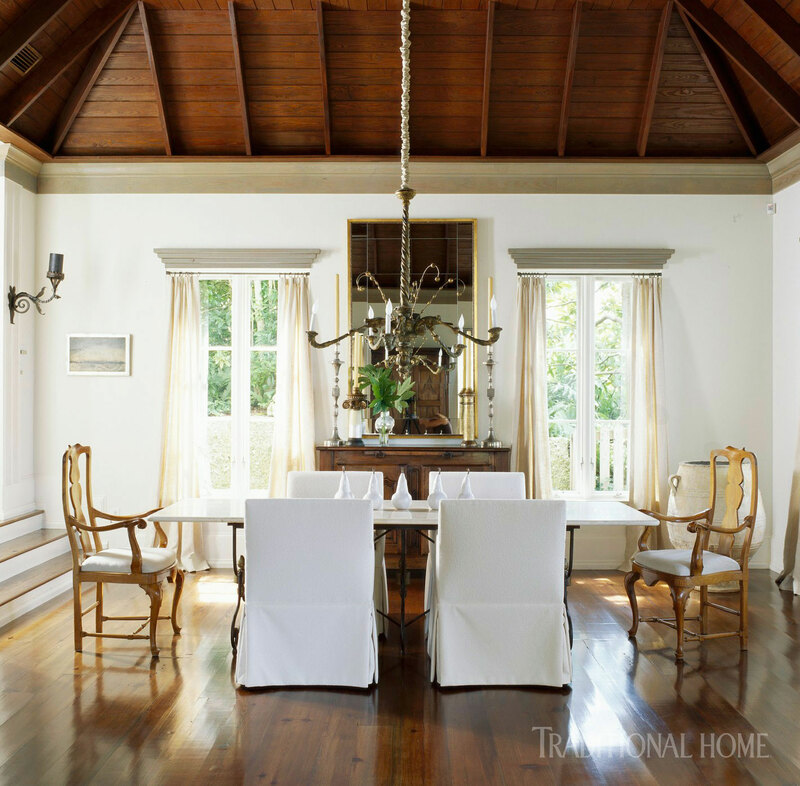 A grand wood armoire anchors one end of the living area, while strong, square armchairs by her hero, designer John Saladino, are pulled up to the long limestone-topped dining table. In the entrance area stands a low, lean daybed by the 20th-century modernist Mies van der Rohe; most people upholster it in black leather, but Leah dressed it in white, a startlingly fresh choice that takes decades off the 1929 design icon. It's a thoughtful departure from the norm that exemplifies Leah's design approach. Vintage shutters line a wall of the study. "My philosophy can be found in Proverbs," Leah says. "By wisdom a house is built, and through understanding, it is established; through knowledge its rooms are filled with rare and beautiful treasures." And don't forget machine-washable slipcovers, too. 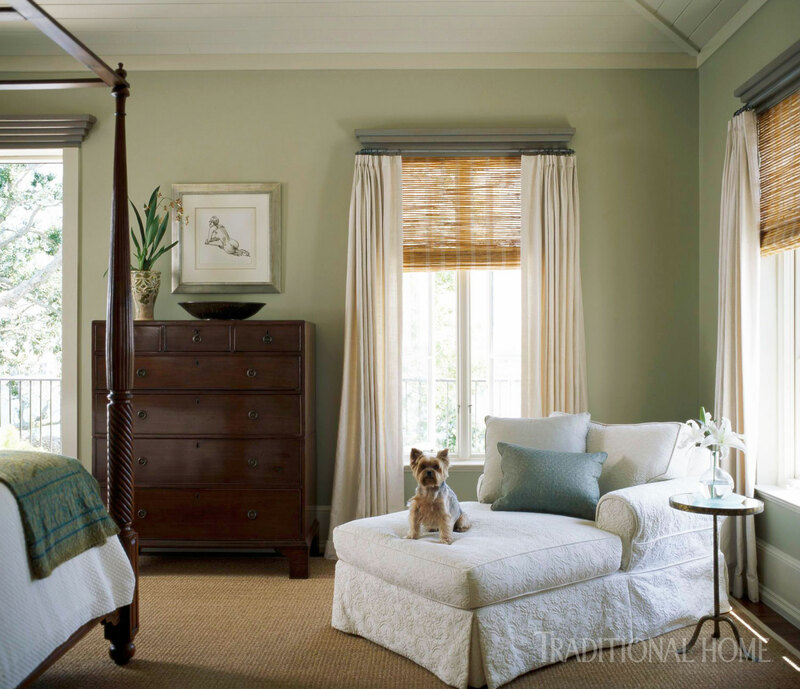 The master bedroom is painted a pale shade of sage; bamboo roller blinds filter the sun. Rudy, the Richardson's Yorkshire terrier is right at home on the chaise. A painting by Leah's artist mother hangs above a chair. 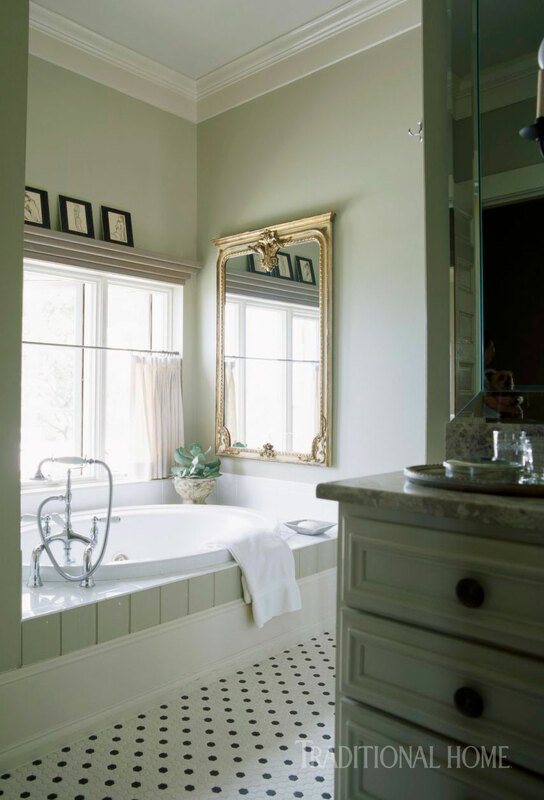 A bathtub is placed to offer a view of Destin harbor. Lisa Richardson and Rudy perch on the tree swing.